Listening to the lyrics and my urge to understand everything - made me look every word up in a dictionary and learn more English! I even read the old saga Beowulf because Marillion's song "Grendl" is about it. That didn't hurt - I found out that it was a great saga! Just one day before I left my hometown for Stockholm to see Fish my pre ordered CD "Fellini Days" arrived. Hurrah! But - I had a "problem". Of course I wanted to listen to it before the concert but I didn't have time! Arrgh. Well. I tried my Walkman. Broken. I called several friends and asked them if they had SOMETHING that I could use to listen to the CD on the bus to Stockholm. No one could help me. Finally a friend at work told me that her son had a Walkman I could borrow. *Whew* I recorded the CD on tape and off I went. I had a great bus ride listening to Fellini Days. It is a wonderful CD with a lot of depth and beautiful tracks. In some way I think it is different from Fish earlier Cd's. I can't put my finger on what it is but it is - different. And I love it. This is the second time I see Fish at Klubben in Stockholm. I saw him 1999 and I had to come back for more. Then came the older songs "Brother 52" and "Tumbledown". And of course, a lot of talking between the songs. This is one of the things I like about Fish - he has such a presence on stage. He talks, makes jokes and "brings everyone in". You feel that you are special and part of the gig. Not many artists manage that. 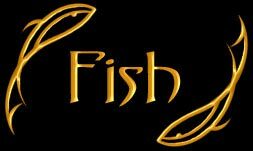 Be sure to visit Fish's official website "The Perception of Fish"
There you can find everything that you ever wanted to know about Fish! It is actually one of the best "artist-sites" that I have ever seen! See some logos I have made for Fish! Updated January 2007. Copyright © Morion. All Rights Reserved.No part of this website may be copied or reproduced without permission.